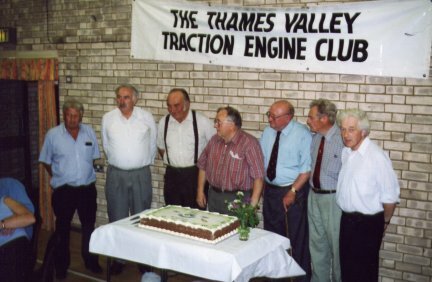 The Thames Valley Traction Engine Club caters for steam engine enthusiasts from Oxfordshire, Berkshire, and Hampshire. The club was formed on 10th February 1961 with Arthur Napper Chairman, Jack Wharton Treasurer, and Ran Hawthorne Secretary. Club meetings are held on the second Monday evening every month at the Englefield Estate Social Club between Pangborne and Theale. The club provides an excellent venue for members to meet, to exchange ideas, to entertain and be entertained, generally providing the facilities required by a very varied group of individuals brought together by the love of steam. Club evenings are extremely varied and include film and slide shows, talks on steam related subjects, and audiences with celebrities. The June and July club nights traditionally take the form of an outing, usually to a fellow enthusiasts premises where engines are put in steam and restoration projects are displayed. Club members meet for an annual road run and evening barbecue, and are regular attendees at local rallies including Stoke Row, Woodcote, and Shabbington.